Giant 3D Hologram Presentation includes Powerpoint and Telepresence technology. Dr. Partho Sengupta stunned the audience at the ASE 2013 with a large scale holographic projection presentation. The lecture topic was based on the merger of modern technology in todays medical procedures. The presenter used a 3D hologram projector to display a powerpoint presentation in 3D floating in mid air. The lecture also included a visit by Dr. Jim Seward as a life sized holographic avatar via telepresence. The lecture was a huge hit with the audience who rewarded Dr. Sengupta with the ASE conferences first-ever standing ovation. The presentation was created in cooperation with Trade Show Holograms, a company that specializes in the creation of both small and large scale hologram projectors in both the USA and Canada. 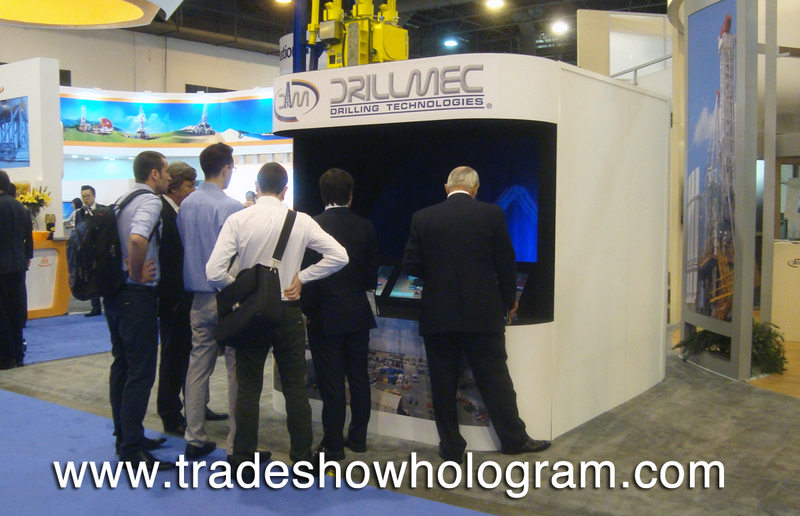 Holographic Projection exhibited at Trade Show – Hologram Projector for sale and rent. Trade Show Holograms exhibited one of their hologram projectors at an energy trade show hosted at the Lost Pines Resort in Austin Texas. The hologram projector proved to be a popular exhibit at the conference. The holographic projection highlighted the features of a new technology in the energy field. The presentation featured 3D images floating in mid air. 3D Hologram projectors are available for both sale and as rentals and are an exciting way to attract attention to any trade show booth.